When Dr. Mechanic first opened his office in the Galeries des Tours in 1984, he was fresh out of his training at McGill University’s Jewish General Hospital residency program (then and still the leading program in the country). Young, enthusiastic – he began building his practice with the philosophy taught him by his parents to always give 100 % . He provided the highest quality dentistry he could, in a warm and caring environment. He was humbled to have people entrust their dental health to his young hands. He took the time to get to know his patients and to give them detailed explanations of their dental condition and all possible treatment options. Today, with more than 25 years of experience at the same location, Dr. Mechanic’s philosophy hasn’t changed. In fact, with the help of his experienced and dedicated team, he believes that the quality of care now provided has even improved. True, dentistry has become much more sophisticated with new techniques and technologies. But, one thing hasn’t changed. Dr. Mechanic has not forgotten that his patients deserve THE BEST! 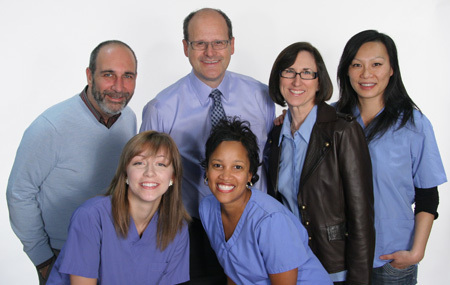 As we are a downtown dental office, we recognize that like us, our patients lead busy and demanding lives. With that in mind, we do our best to stay right on schedule (and usually succeed), so as not to disrupt our patient’s busy days. With the Square Victoria metro station right beneath us, patients from all over Montreal have direct access to our office. If you ask any of our longtime patients, they will remark about the synergy of the fantastic, experienced team that provides our patients with the unsurpassed level of care we are so proud of. At reception, Debbie (who opened the office with Dr. Mechanic and has been with him ever since 1984) is complemented by Howard as do Valerie and Amanda, our highly experienced and dedicated hygienists. Aisha is Dr. Mechanic’s superstar chairside assistant who possesses the right blend of ability, empathy and perfectionism. Dr. Mechanic’s plan has always been so simple; treat all patients the way he himself would like to be treated. It all begins with taking the time to properly explain to the patient what their problems are. As there are so many different materials and techniques available today, the next step is to help the patient choose the right one for them, depending on their needs, desires and financial ability. Finally, Dr. Mechanic and his team take the time to carry out the chosen treatment to the highest standards available. That means not only doing the appropriate procedure, but more importantly, taking the time to do it properly, with the highest quality dental and laboratory materials available which will stand the test of time. All of this is done with the strictest standard of sterilization and infection control. If you would like to experience the high level of care that we can offer you, we would be honored to have you join our practice.